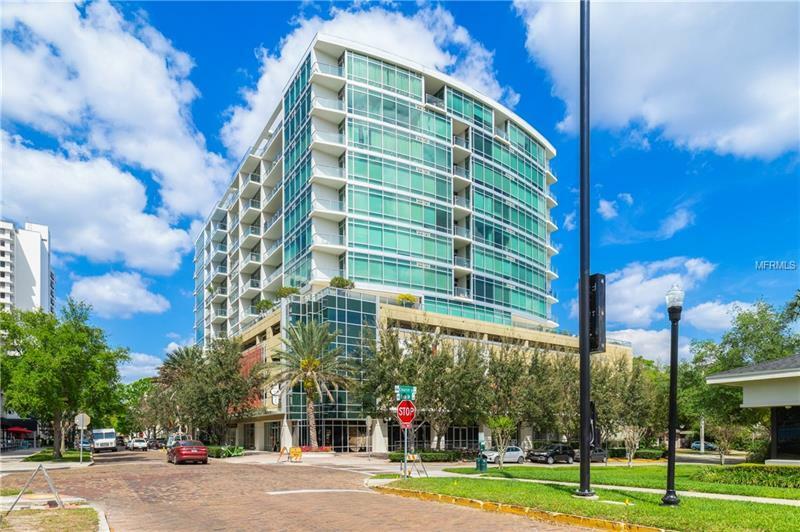 LIVE IN THE HEART OF THE EOLA DISTRICT in this move in ready studio condo in highly sought after 101 Eola. Located just steps from Lake Eola and Thornton Park, this condo features a separate bedroom area with an attached and updated full bathroom. The bathroom showcases an updated vanity, modern marbled look Epoxy flooring along with new modern fixtures and mirror. Around the half wall is your open and bright kitchen with dark cherry cabinets and black granite countertops. New fixtures and fans add to the updated feel of your new home. The living room is ample in size and overlooks the balcony and views of the Downtown Orlando skyline. The condo building is filled with amenities including a large clubroom with kitchen, pool table and TVs, along with a lap pool, sauna, gym and gorgeous lobby! The bottom floor of the building features restaurants, salon, boxing studio and just across the street are more restaurants including Oudom Thai and Sushi, The Stubborn Mule and more! This really is the perfect downtown condo!